Walt Disney World is busy any day of the year, but there are times when there will seem to be wall to wall people. Thanksgiving Break, Christmas through New Year’s, the month of July, and three day weekends will all be packed. That doesn’t mean you should stay away, you just need a plan. Here are ten suggestions to help you survive crowded days. On busy days, it’s all too easy for kids to wander off and get lost in the crowd. Keep them close so that you won’t have that problem. Also teach them to look for Cast Member name tags in the event that they can’t find you. Cast Members know how to handle lost children. They will make sure that your child is safe, and that you will be reunited quickly. Each day at least one theme park will have Extra Magic Hours. If you are staying on property, you might want to take advantage of the time in the morning that the general public will not be allowed in the park. When the crowd picks up, leave for another park. If the hours are in the evening, head in that direction a little bit before Extra Magic Hours kick in. 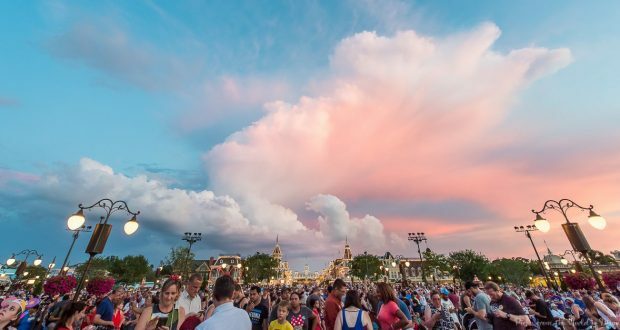 If you’re not staying on property, you might want to avoid an Extra Magic Hours park if you want to stay away from the crowds. On crowded days, even the lines for snacks might be long. You can bring snacks into the parks with you, so throw some bagels or granola bars into your bag. That will mean that hunger pangs can be satisfied quickly, and you won’t have to wait in line at a snack kiosk. Quick service restaurants will be packed at traditional meal times. You’ll have to wait in line to order, and you might have a hard time finding a table. Plan your meals a little bit before traditional meal times, and you won’t have to wait as long. Another tip is to use Mobile Ordering through the My Disney Experience App. That will save you time, which is important on a crowded day. On a day when the parks are packed, you might feel like all you do is wait in lines. There is a way to enjoy great entertainment without having to wait yet again. Check the My Disney Experience App and see what extra entertainment is taking place. Known as Streetmosphere, these are short shows that give you a chance to take a break. The Dapper Dans at the Magic Kingdom, Jeweled Dragon Acrobats at Epcot, Citizens of Hollywood at Disney’s Hollywood Studios, and Swotu Waya Na’vi Drum Ceremony at Disney’s Animal Kingdom are just a few of the possibilities. Streetmosphere is additional magic that you can enjoy on a crowded day, without standing in line. The full service restaurants at Walt Disney World are all unique. The food is delicious, and the restaurants are filled with atmosphere. If there is a place that you really want to try, make a reservation as soon as you can. Reservations can be made up to 180 days in advance, and during crowded times some restaurants will fill up that quickly. If you didn’t make a reservation in time and want to enjoy a relaxing, full service meal, see if something is available at a nearby resort. You can leave the jam-packed park for a couple of hours, and enjoy an incredible meal. You’ll then be ready to brave the crowds again. No dining reservations? Take advantage of Mobile Food and Beverage Ordering on your My Disney Experience App at multiple Quick Service locations across Disney World property. The My Disney Experience App will make your vacation easier no matter when you visit. On a crowded day, you will want the shortest waits possible. Use the app to check Wait Times. If you’ve waited in a couple of long lines, find the shorter waits and get in those lines to give yourself a break. You just might find a new favorite ride. FastPass+ is essential if you plan to visit on a crowded day. The system will allow you to make up to three reservations a day for each day of your ticket. Find the most popular rides that are on your must-do list, and see if you can snag FastPass+ for them. That’s three fewer long lines that you’ll need to wait in! Once you’re in the park and have used all three selections, you can make another one using the app or at a kiosk. After you’ve used that, make a fifth, and so on. You might not be able to get the most popular rides the day that you’re there, but every Standby Line that you can avoid is a blessing on a crowded day. The parks are the least crowded when they first open. Find out what time the park is supposed to open for the day, and make sure that you are there well before rope drop. You will be surprised by how much you can get done in the first couple of hours of the day, even on the most crowded days of the year. The most important thing that you can do to survive a crowded day at Walt Disney World is to be patient. Be prepared to wait, because many of the lines will be long. Don’t complain about the crowd, because you’re adding to it. Be nice to the Cast Members, they’re doing their best and they have to deal with some nasty comments on crowded days. Know that you won’t be able to do everything, and just have fun. If you’re patient instead of frustrated, you will have a much better time.